Welcome to Week 8 of the CAL! This week will be the last week we will be making squares and appliques! Next week will be all about joining the squares and making the border. This has been such a rewarding experience to get to see crocheters get together and make something memorable. The wreath applique is fairly simple, but from what I’ve seen in the Facebook group – I know some of you will spruce it up and I can’t wait to see all the creativity! I know many of you are wondering when and if there will be a next crochet along and I can say I’m in the planning stages! I’m bouncing ideas back and forth and figuring out when and how long it will take place. I will be asking in the Facebook group for thoughts/suggestions – if you aren’t a part of the yarn friends community yet you can join here. This week we will be working up 8 granny squares along with the Wreath Applique. All the patterns and video tutorials that you will need are below. If you would like to purchase the complete pattern, you may do so here on Ravelry. If you need to go back to the main page of the CAL – click here. If you need to take another look at the materials list – click here. & most importantly, pat yourself on the back for completing ALL the squares and appliques!! 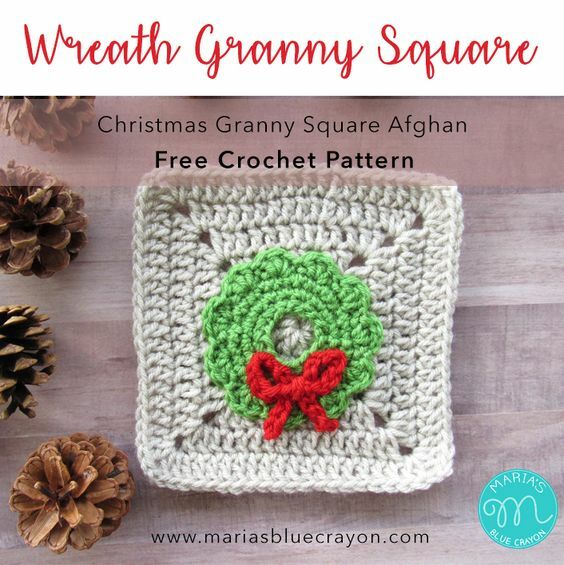 Find the GRANNY SQUARE PATTERN HERE. Chain in the beginning of each round does not count as stitch. Chain 35, fasten off. Leave tail for sewing onto wreath. You may need to disable your ad-blocker if you are not able to access the video tutorial below. Or you may view the video here on YouTube. PIN IT TO YOUR PINTEREST BOARDS!